Now that the holidays are over, are you looking around your home wondering how you’ll ever clear it of clutter? It can be a daunting task, to say the least. And while some organizing experts say it can take weeks or months to properly purge, that can feel overwhelming. Take the pressure off by committing to a simple, weekend long decluttering schedule. By following these tips, you’ll feel much less stressed come Monday morning. Before getting started, you should take a few days to get yourself organized and make a plan. Try to schedule your purging weekend at a time when you don’t have many other commitments. The more you can focus on the task at hand, the better. Gather the supplies you’ll need including boxes, trash bags, tape, markers and storage containers. Make a list of all the rooms you’ll tackle, and how much time you think you’ll need for each. Once you begin a room, set a timer. It might sound crazy, but it works. Setting a timer will keep you motivated and on task. It will also help you make tough decisions knowing that the clock is ticking. How many times have you found an item in your home that you totally forgot you had? Why are you still holding on to it? The more items you keep that you don’t use, the more time you spend taking care of them. Do yourself a favor and purge those things you no longer use, clothes that don’t fit, and items that are broken. Make a pile for discards. If you are having a hard time deciding about certain things, create a separate pile you can come back to later in the week. Remember, the things you no longer use could still have life left in them, so think about donating those items to charity. Once you’ve decluttered each room, give it a good cleaning. Wipe down surfaces and vacuum or mop the floors. Get the dust bunnies out of the corners and open windows for some fresh air. You don’t have to give each room a deep clean, but do take a little time to tidy up. 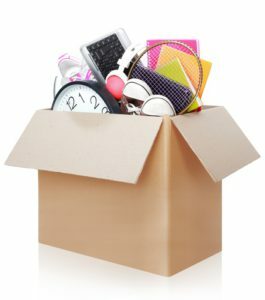 Now that you’ve got all those unused and unwanted items cleared away, it’s time to organize what’s left. Yes, this can be a challenging task. But don’t feel like it has to be perfect. Look around your home for storage containers you already have, such as plastic tubs, boxes and baskets. Keep similar items together and mark boxes with their contents so you don’t forget later. At the end of the weekend, don’t forget to take a little time to celebrate. Decluttering is hard work, and can often inspire lots of emotions, so feel proud of your achievement. Have a nice long soak in your clean bathtub, or invite some friends over for pizza and a movie. Take time to appreciate your home and congratulate yourself on a job well done! You deserve it!